Within the first six months of training with the CrossFit principles, I gained about 15 pounds and was back to a respectable 170 pounds. Now, I should also mention that I quit swimming altogether, stopped the two weekly cycling sessions with my club, and only ran to work, rather than running on the weekend. So my cardio or LSD training consisted of cycling to work 3-4 times per week, and running to work once a week. To his surprise, he got even faster. This marked the first time that I qualified for the Worlds, and was also my fastest time on this course. One month later, in Kelowna, BC for one more pre-Worlds race, I improved my time and overall standings with a PR of 2:16. Adding to the triumph was the fact that I was able to celebrate it better; instead of my normal post-race headaches and lethargy, my post-race recovery was so good that I actually enjoyed the remainder of the day. The CrossFit community is full of people just like me, who have had to overcome a disability, or disease, or illness, as well as the line-up of people who get in the way. Just as we see from the CrossFit Journal articles featuring Kyle Maynard, who was born a congenital amputee and overcame his situation to compete at the State level in wrestling, I don’t feel as though I have a disease or disability; I have a card that has been dealt to me, and I must play it. The CrossFit community is a place of like-minded people who have all played their own cards, and in doing so have been creating a stronger world, one person at a time. There are 14 comments on this article. Login to add your own. Wow!!! Great article! Very inspiring! Very well written article, enjoyed reading your story very much. Great article! Can't wait to share it with my LSD biking friends at work! Way to break free of LSD! Thanks to everyone for the positive comments! The good thing about breaking free of the LSD is that there were no withdrawal symptoms! In fact, life got better because I had more energy, and my grocery bill decreased substantially. Johanna, I am interested to hear what your LSD friends have to say about this! I'm having trouble downloading this article. For some reason, it keeps telling me there is an error. The error only seems to happen on Firefox. When I open this article in IE, it works fine. Karl - great work and glad to hear that you have some additional time for your family. 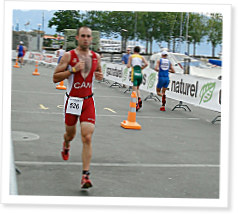 Triathlon is amazing that it has one of the most highly educated populations of participants but some of the most arcane training traditions: high volume miles and laps, moderate intensity individual riding and running and all around mediocre intensity. For most triathletes outside of elite Ironman competitors I think Crossfit is the secret weapon for developing power and training the anaerobic threshold. Combine Crossfit with motorpacing, fast group rides, speedwork, challenging open water swim training and the occasional stop to puke in the bushes you'll be world class in no time. Thanks for your comments...this may help.. The triathlons that I was doing were Olympic distance, so yes, it is much easier to do with less training. I have never attempted an Ironman distance, mainly because I would be bored with the training and would quit before I even got close to the race. I did however, complete a half-ironman with 1 swim in 18 months, Crossfit style workouts that were no longer than 60 minutes from warm-up to cool down, and cycling to work 3-4 days per week (total 25km return), one run per week (12km) and 1 Ashtanga yoga session per week. I live in Edmonton Alberta, cycling to work at -30 degrees Celsius in the snow is not the most enjoyable experience, but because I did that, I was able to spend the evenings relaxing with my wife. Sometimes the sacrifice didn't have to be from my family. I didn't swim because I injured my shoulder in the pool and I decided to try staying away from the water for as long as I could. When I jumped in the water, I was slow, but I finished the distance and then had two of my strongest activities ahead, the bike and run. I believe the key is quality training, quality nutrition and quality rest. Many of my triathlon friends are always injured, mostly because they are always doing the same thing, and do not supplement with strength training, technique, and proper rest. All of my training had a focus...technique runs, technique rides, and focused movements in my workouts. Just because I was not in the pool did not mean that I wasn't able to do swim movements. I had a few exercises that I would do each week for rehab on the shoulder in the swim strokes, but I can honestly tell you that I did not see water for 18 months. Out of the 3 events in the triathlon, I hated swimming the most, so it was easy to stay away. I did write that in the few weeks before the race, I changed my training to be more specific to the triathlon. This gave me an opportunity to get a few more swims in, and to do some brick style training. I did continue to strength train...that didn't change, I just went from 3-4 sessions a week down to 2. You do not have to believe me, I know what is true, and so do my friends and family. I trained a colleague for Ironman Canada a couple of years ago and this was her 3rd triathlon. She did a sprint, a half ironman, and then trained for the full distance. She followed the same training style and compared her training with her friends who did volume based training. They all told her that she would not be able to do it. We laughed and she did the full distance faster than the majority of her friends, some of who could not complete the race. The only thing she did differently was that she swam 2 times a week because she was a terrible swimmer, and every 4th week she did a mini triathlon on her own. These mini distances at their longest were no longer than the olympic distance, yet she was able to learn her transitions, and understand how the 3 events would feel when placed together in one workout. This may not work for everyone, especially for those who are skeptical or who do not believe in themselves. I encounter this all the time, from friends, family and people who simply don't want to accept that there may be a different way. The mind is a powerful tool, and I am certain that it is the most important tool that an athlete can have in their tool box. The same goes for anything in life, if we believe that we can do it, then we will. Unfortunately, for the majority of people, we choose the other angle and spend most of our time wishing that we could have done this and that. I hope that this helps you understand my situation a bit more. I also hope that you one day find the balance between finishing an ironman and less training. When you do, please write about it for those who can benefit from it. Nothing would make me happier to see that more triathletes/endurance athletes find time for their families on Saturday and Sunday, or any day for that matter. It was a wonderful experience being able to say yes to friends and family who wanted to see me on any day of the week. Awesome article! As a triathlete, it's great to see how you mixed elements of tri training and Crossfit - the 20-30 minute 3k/750m AMRAP bricks are genius!! I've transitioned to a mostly CF training plan for this season, so it was great to see the concept validated by an elite age grouper. Karl I just read your story and loved it! I got into triathlons about 6 years ago and love the friendships and the training together but have to say I sure found it very tiring to be sore and tired for work Monday morning! Plus on going injuries from too many miles of running. I have been doing crossfit for 4 months now and love the WOD and how I feel. I'm just stronger in everything I do. Like crazy stronger than before! Also, the chronic hip pain from running is 60 percent less. Gotta love air squats for opening the hips and making them more flexible. I plan to do a half iron in July so I'm just starting to design how I will do it crossfit style. I want to just look at it like a different event with the goal of finishing with gas still in the tank. If you have any other nuggets to share for training for a half iron it would be much appreciated.